Last year, the New York Times finally took down it’s pay firewall. It was a great day for those of us who get most of our news online, while wasting time at work. One of the last paid firewall holdouts in major media is the Wall Street Journal. There was plenty of speculation that after Rupert Murdoch got his liver-spotted hands on the Journal, he might relent and let the paper go free online. After all, this is Mr. MySpace, right? He “gets” web 2.0, doesn’t he? Well, not so much. Most times if you try to read the WSJ online, you get an annoying notice that you haven’t ponyed up for the content. Well, some enterprising blogger by the name of Daggle* has cracked the pay firewall code. You can’t yet browse the entire Journal at your leisure (unless you’re a subscriber). But what you can do is hack your way into individual articles. Know of an article you want to read in a recent edition of the journal? Get the article title… say, “Capital Charges Expected Against Six Alleged Leaders of 9/11 Conspiracy.” Go to Google news (news.google.com) and simply put that article title into the search box. Boom. You can click through to the full article sans pay firewall. Apparently the WSJ has some sort of content delivery deal through Google News. Not sure how much longer this will last. Rupert won’t like it if this gets around. 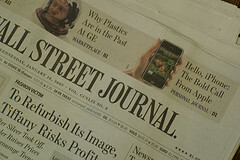 But if the WSJ is your bag for news browsing at work, for the time being, you’re home free. Read the original article for extensive instructions from Daggle here. *Update: Sorry for being an ignoramus… Daggle is Danny Sullivan’s personal blog. Some sites that block their content often allow Google’s crawlers to access it (which makes sense, you want the full text of your articles crawled to maximise the number of keywords that can send people to your site). What’s interesting about this though, is that these articles are often saved in Google’s cache, so if you see a search result for one of these pages in Google, click the ‘Cached’ link underneath the result and voila! unblocked content happily at your perusal. Or use a tool like this one and you can see pages exactly as Google’s crawlers see it. Actually, you’re right. I can see that now that you point that out. Good tip.